Money will create scholarships for students. 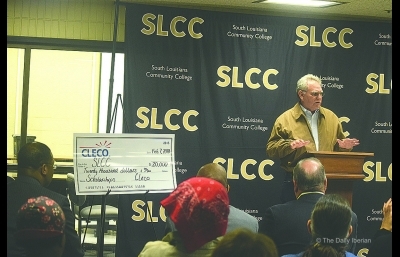 Officials from Cleco Corp. announced a $20,000 investment into South Louisiana Community College Wednesday morning at SLCC’s main campus. Several business and parish leaders spoke at the event in regards to the announcement. Jude Hebert with Cleco said the scholarship will work to benefit low-income residents and displaced workers. The scholarship comes almost two years after Cleco was bought out by the Australian investor Macquarie Group. Hebert said a committee was formed to ensure the community that Cleco is still interested in investing in Iberia Parish, and SLCC was one of the first candidates. Director of the Iberia Industrial Development Foundation Mike Tarantino said Cleco remains an important partner in developing Iberia Parish. Iberia Parish President Larry Richard was unable to attend the event, but executive assistant Cynthia Provost said the administration was proud to have partners like SLCC and Cleco. “This is going to help employment and this is going to help families all across the parish,” Provost said. Students in degree programs and some training courses will have $1,000 scholarships available. However, those students must be enrolled full-time, residents of Iberia Parish and Cleco customers. They must also be either displaced or low-income residents. Students can apply beginning March 15 by visiting www.solacc.edu/scholarships.